My Chabad envy is well chronicled by now. Today I am taking this envy to new heights by taking the bold steps of proving that the first Chabad Rebbe, Shneur Zalman (1745-1812), was almost certainly right about the spelling of a particular word in the Tanakh. And I relied on some old sources, with a little help from my friends, to do it. First, let me tell you how we got here. I was preparing Learning 4 in my series on Karaite Judaism. The focus of Learning 4 is to lay out a coherent framework for Karaite Judaism, while explaining the three pillars of the Karaite movement: The Text (Kathuv); Inference (Heqqesh), and The Burden of the Inheritance (“Sevel Ha-yerusha”). I had wanted to say the following line, which in fairness I “borrowed” from a conversation I had Hakham Moshe Firrouz, everyone’s favorite neighbor, “We do not disagree with our brothers, the Rabbanites, about a single letter of the Torah.” His point was that our disagreement with the Rabbanites is a disagreement of interpretation – not a disagreement over the text. As I rehearsed this line, I started thinking about a debate (which as far as I am aware only exists within the Rabbinic community), about whether the word “daka” in Deuteronomy 23 is written with an Alef at the end, or with a Heh: Dalet-Kaph-Alef (דכא) v. Dalet-Kaph-Heh (דכה). In fact, I first learned about this debate while having dinner with my local Chabad rabbi. I reached out to Nehemia Gordon, and asked him whether he was aware of any Karaite opinions on this. He responded very correctly that this is not a Karaite v. Rabbanite issue: this was a masoretic text issue and he offered to check some manuscripts for me. His response nicely framed the issue; too often my natural mindset is Karaite v. Rabbanite. But in this case, we could actually look at sources (independent of theology, presumably) and see what the Tiberian Masoretic scribes actually wrote (and could weigh the evidence). Remember, regardless of whether the scribe was a Karaite or a Rabbanite, they were trying their very best to preserve with as much accuracy as possible the precise letters of the Torah. Based on the images below, it is clear that the early Tiberian Masoretic manuscripts preserve the spelling with an Alef – just like the first Chabad Rebbe instructed. The truly amazing thing is that these manuscripts represent a cross section of ideology. The Leningrad Codex was almost certainly written by a Rabbanite for the Karaite community (and indeed remained in the Karaite community for long periods of time). 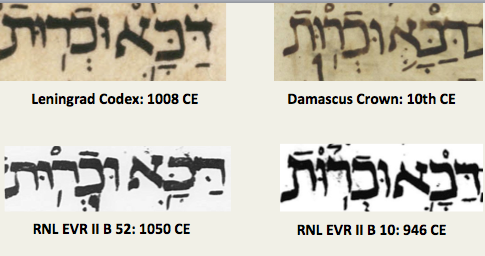 Each of these early MSS show that Daka as spelled with an Alef. Although the Aleppo Codex for this verse is lost, the Masora Gedola (these are masoretic notes that are written at the top and bottom of a codex page), states unequivocally that the word Daka was written with an Alef. And of course, the Aleppo Codex was almost certainly written by a Karaite to be shared with all scholars, though this is a debate that endures. Nehemia also provided me with the Masora Gedola for for Psalms 90, below [*1]. So, if all these early manuscripts show that Daka is spelled with an Alef, why would the first Chabad Rebbe even need to instruct that Torah Scrolls be written with an Alef. It turns out that (for reasons I am currently unaware) there is an alternate textual tradition in which it is spelled with a Heh. I contacted one of the world’s foremost biblical scholars and he expressed his opinion that the dispute between those who prefer the Heh and those who prefer the Alef is a real dispute and it is not simply an error. Here is a relatively late manuscript – also provided by Nehemia – showing the word is spelled with a Heh. To be clear, this is not an exhaustive search of the manuscripts, and a more coherent review would need to include Tiberian Masoretic and as well as Babylonian manuscripts to determine where the earliest evidence of Dakah (with a H) can be found. So if anyone has evidence of an early (pre-1100) manuscript (Tiberian Masoretic or otherwise) with a Heh, I would greatly appreciate your pointing me to it. By the way, I was recently discussing this issue with someone and I asked him for his views on the spelling of the word. He told me that he once received a Torah scroll as a gift from a dear friend, and saw that daka was spelled with a Heh, so he personally scratched out the Heh and personally wrote in an Alef. [*1] For those who do not read Hebrew, the note says, “Daka [spelled with an Alef] [occurs] three [places]” and then it quotes the biblical verses. Alef, He, Yod, and Waw are, in essence, the same- which can be proven by conjugations. This phenomenon happens in all Semitic languages; for instance, in Aramaic להוא is also written להוה . Even in nouns- especially older names- Alef, Yod, and Waw are often interchanged for instance מהויאל versus מהייאל . Even the Hebrew ילד is written like the Arabic ולד. Generally agree. There is no interpretive impact here. The form “Walad” (ולד) of the word “Yeled” may well have appeared in the Ruth Scroll under the influence of Moabite, which impacted the Hebrew of the Scroll generally. What about the occurrences of the word in the DSS ? I don’t have access to the DSS- except what is published at the DSS site; I will have to dig through it and see. Other than that, I have been searching the internet for possible sources, but I have not found any yet.